Gwen Thibeaux is a motivational teacher, speaker, entrepreneur and author of "Embracing the Greatness Within: A Journey of Purpose and Passion." She is also the Founder and Director of EYG Academy and Training Institute, inspiring and motivating people around the world to discover and embrace the greatness within. She has been affectionately referred to as "the woman of greatness." Gwen currently serves as the 2009-2010 President for the National Association of Women Business Owners (NAWBO)-Inland Empire Chapter. Gwen has been featured in the Press Enterprise; Voice and Viewpoint in San Diego; The Business Press' People on the Move and other publications. 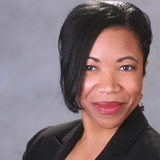 Gwen was a 2009 Women Making a Difference award nominee sponsored by the LA Business Journal. In 2010, she was awarded the NAWBO-IE ANITA Award for her dedication and outstanding service to NAWBO-IE. Gwen has a Bachelor of Science degree in Business Management and is pursuing her Master of Arts degree in Counseling at California Baptist University. Gwen has written several articles and eBooks, including "The Truth About Fear: How to Eliminate its Effect on Your Success Potential." Gwen lives in Southern California with her husband and two children. Be willing to explore all opportunities. Abandon all excuses and stop procrastinating! Gwen Thibeaux believes that all things ARE possible and that every single idea, whether big or small, can create great vision into one's life. Her divine visions about her own life and purpose became the premise to her business, thus the company's name sake--Divine One Management. Passionate about serving others, Gwen employs the principles of servant leadership in her business. Her genuine concern for her clients, combined with strong organization and leadership skills, allows her to exceed her clients' expectations over and over again.